Following on from lesson 4, this rc flight school page will help you choose a suitable location from where to fly your rc airplane. Pay attention to this one, because flying in the wrong place can potentially be very damaging to our hobby, especially since the rise of the drones and some associated negative press that the hobby has had in recent times. Club, private land or public area? These are pretty much your three options for finding somewhere to fly rc airplanes. 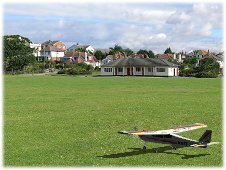 It could be that you have an rc flying club close to where you live - use the rc airplane club directory in this website to see if there's one within a convenient distance from home. If there is, do consider joining especially if you're thinking of flying IC powered planes. Such airplanes are more involved than your typical electric park flyer, so help from other modellers is always a good thing. If there's a club nearby but you don't want to join, it's a very good idea to pop along to their field one weekend and talk to the members about flying in the area. Frequency interference is a very serious issue and can't be ignored if there's potential for conflict. While it's true that most of us are using 2.4GHz radios these days, it's still very possible that you have bought an rc airplane that utilises a traditional MHz radio system. This is where you have to be very concerned about radio interference from or to other flyers nearby. If you and another flyer are both using a MHz radio within close range (a mile or less) then you need to be sure about who is on which frequency. If you're lucky enough to have access to private open land - either your own or a friendly farmer's - then you can fly from this so long as you have permission to do so. 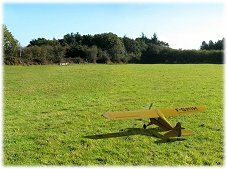 Private land is the preferable option over flying from somewhere public, because you can pretty much do what you like when you like, without the worry of being yelled at by a member of the public who doesn't like rc airplanes! Of course, it could be that you've bought an ultra micro type electric rc plane and that your back yard is big enough to fly it in. Lucky you, you're in an enviable position! Your final option is to fly your plane from a public area. Depending on the size and type of your airplane, suitable locations include public parks, sports fields, ball parks, beaches, open hill sides.... You get the idea. so long as it's permitted! The crucial thing to remember when flying in a public area is safety. Read these rc flying do's and don'ts for flying your rc airplane from such a place, and always use common sense and act responsibly. As strange as it might seem, not everyone in the world enjoys watching an rc airplane zooming around the sky. It only takes the wrong kind of person to complain to a local authority, and that location can quickly and easily be shut down to model flyers. So always always think about where you're flying, and be responsible. None of us want this hobby to get a bad reputation. On that note, the radio control flying hobby has never been in the public eye as much as it now, thanks to the popularity of rc drones. We're all at risk of being caught up in strict new rules and regulations, so choosing a suitable flying site is more important now than it ever has been. And watch this space, because things are only set to become tighter as governing bodies crack down on UAV operations. Wherever you want to fly from, your flying location needs to be open and spacious. The size of your plane will determine what size area you need to fly in, but for, say, a 40 inch wingspan electric RTF airplane a ball park would provide ample airspace - that should give you an idea of the kind of area you should be looking for. Tip: when searching for local flying sites, use Google Earth, Google Maps or Windows Live satellite imagery - it's simply the best way of searching your area quickly! Presence of objects such as trees, posts, pylons, lights, power lines etc. How close members of the public will be to you while you're flying. Proximity of houses, schools, offices, shops etc. Proximity of roads and highways; rc planes can be a big distraction to some drivers. The bottom line is that you need a large(ish) open space where there is no danger of causing trouble, being a nuisance or risking damage to people or property. And on that note, you absolutely must check local regulations and laws to see if flying radio control aircraft is even permitted. If it's not, and you take to the skies, you could well have an angry official breathing down your neck and writing you a ticket! Another point to make is that of the sun position. The last thing you want is to be flying across the sun (this is a definite no-no), so do pay attention to where the sun is in relation to where you'll be flying. The ideal situation is for the sun to be behind you so there's no danger of being blinded as you're flying. Another hugely important point you need to consider is public liability insurance. It's not so critical if you're flying from private land (although still recommended), and if you join a club then insurance is usually mandatory anyway, but if you're flying from public land then it's well worth taking it out. Model flying liability insurance protects you against damage to people and property, which can easily happen in unfortunate circumstances. Third party liability insurance for rc flying isn't expensive and will give you good peace of mind. Take some time to look in to it and contact your appropriate organisation from the list above for further information. 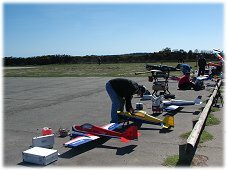 If you follow all the pointers on this page, you should be able to find where to fly rc airplanes safely. Most of us are close to some kind of open land, but you do need to think through your flying site and weigh up the pros and cons of the location. Be safe, and be responsible when deciding where to fly! Next up: Lesson 6 - How to do your pre-flight checks. Lesson 7: Take off / hand launch.